This is the transcript of a small packet of letters written by Lieutenant Colonel Charles Morland to his family and now held by the Centre for Kentish Studies, who have kindly given permission for this publication. This particular manuscript consists of a short series of very interesting letters from the Egyptian campaign of 1801 and one from the Peninsula dated 1812. Charles Morland originally joined the 12th Light Dragoons in 1796 and became a Lieutenant in the regiment by purchase in the same year. The regiment was soon sent to Portugal with a force commanded by General Sir Charles Stuart, where they were to serve until 1799. Morland purchased his Captaincy in the 12th in 1799 and accompanied the regiment to Egypt, where he witnessed the capitulation of Cairo and Alexandria. On his return he joined the Staff of the Earl of Rosslyn, as his aide de camp and served with him at Stralsund and Copenhagen in 1807. In 1809 Morland purchased his Majority in the 17th Light Dragoons, but continued to serve as aide de Camp to the Earl of Rosslyn, who acted as the Assistant Adjutant General at Walcheren, during that ill fated expedition . 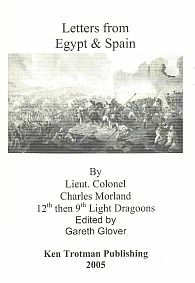 He then exchanged with Major Orde of the 9th Light Dragoons in 1810, commanding this regiment in Spain and Portugal until the retreat from Burgos. The regiment was brigaded with the 13th Light Dragoons and 2nd Hussars King�s German Legion under Major General Long and took part in General Hill�s surprise attack at Arroyo dos Molinos. The regiment covered the siege of Badajoz and remained in the south with Hill until the retreat from Burgos, when it formed part of the rearguard. He had succeeded in purchasing the position of Lieutenant Colonel in the 50th Foot on 29 October 1812 who were also in Spain but exchanged back into the 9th Dragoons on 4 March 1813 vice Lt Colonel Vicomte de Chabot. The regiment was ordered home later that month, marching to Lisbon on foot having given up their mounts to the 13th and 14th Light Dragoons. Morland saw out the remainder of the war on home service.